Rowena is a tutor in the Department of Medical Education within the Melbourne Medical School. She also works as pre-hospital emergency medical response team doctor and is a basic and advanced life support instructor. Her medical experience includes Registrar positions in Anaesthetics, Rural and Remote/Emergency Medicine, and Neonatal/Paediatrics (and some O&G training). She has a strong interest in pre-hospital and wilderness medicine, and is passionate about medicine in extreme environments, especially aerospace medicine. 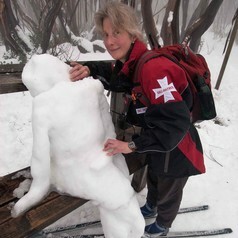 Rowena has a long-standing association with the Australian Ski Patrol Association (ASPA) as an educator and volunteer and is the Chair of the ASPA Medical Advisory Committee. She is also the RACGP representative on the national Australian Resuscitation Council and a Board member for the World Association for Disaster and Emergency Medicine (WADEM). Rowena also serves on the Space Life Sciences Committee of the Australasian Society of Aerospace Medicine and is Chair of the Associate Fellows Group, Aerospace Medical Association and the Informatics Committee lead. In 2016 she was the Dux of the International Space University Southern Hemisphere Space Studies Program. In addition to her medical career, Rowena also has a wealth of experience as a lawyer, management consultant, and small business owner/operator.